Sharks are often seen as a threat to humans and, as a result, there is increasing interest in developing shark mitigation devices. 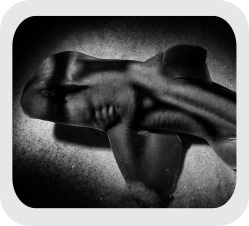 In this study, we assessed the effects of an intense strobe light and artificial sound on shark behaviour. 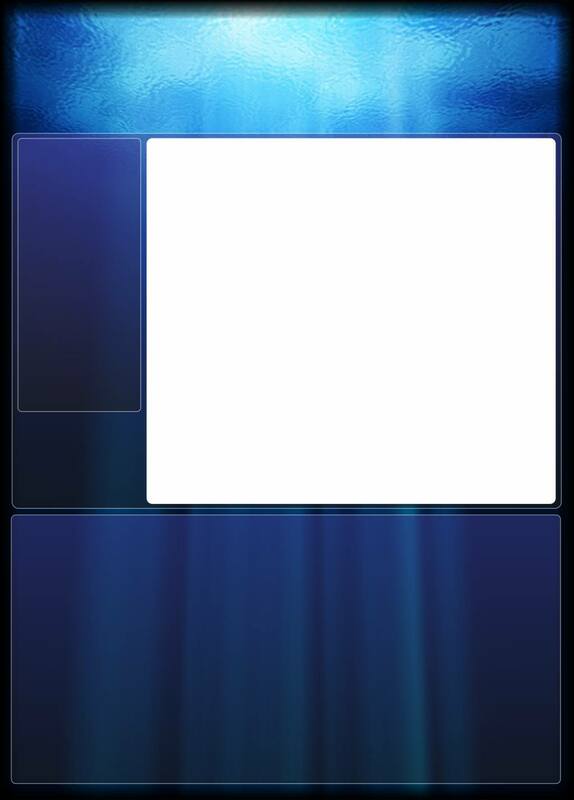 When presented alone, and in combination with sound, the lights reduced the number of times that the bait was taken. 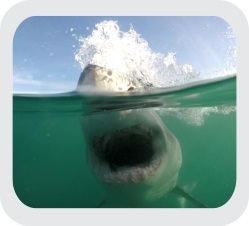 The strobe light alone, however, did not affect the behaviour of white sharks, but when presented in combination with sound, white sharks spent significantly less time in proximity to the bait. 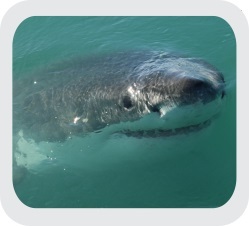 Research Paper: Ryan LA, Chapuis L, Hemmi JM, Collin SP, McCauley RD, Yopak KE, Gennari E, Huveneers C, Kempster RM, Kerr CC, Schmidt C, Egeberg CA and Hart NS (2017) Effects of auditory and visual stimuli on shark feeding behaviour: the disco effect. Marine Biology 165: 11. 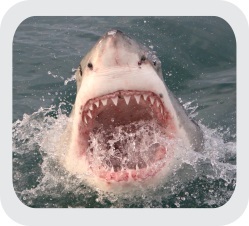 Personal shark deterrents are being marketed as the solution to mitigate the threat that sharks pose. 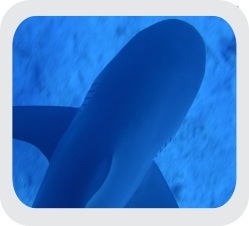 However, the effectiveness claims of many personal deterrents are based on our knowledge of shark sensory biology rather than robust testing of the devices themselves, as most have not been subjected to independent scientific studies. Here we tested the effectiveness of the commercially available shark deterrent device, the Shark Shield. The results of this study provide the first quantitative evidence of the effectiveness of a non-lethal electric shark deterrent. Elasmobranch fishes (sharks, skates and rays) possess a highly sensitive electrosensory system that enables them to detect weak electric fields, such as those produced by potential prey organisms. Despite several comparative anatomical studies, the functional significance of interspecific variation in electrosensory system morphology remains poorly understood. 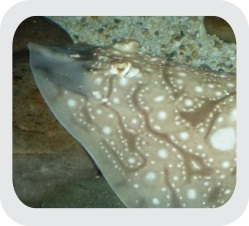 The results of this investigation suggest that differences in abundance and distribution of electrosensory pores have little to no effect on the absolute electrical sensitivity in elasmobranchs, and instead, may reflect species-specific differences in the spatial resolution and directionality of electroreception. The eyes of five ray species (Taeniura lymma, Neotrygon kuhlii, Pastinachus atrus, Himantura uarnak and Urogymnus asperrimus) from the same taxonomic family (Dasyatidae) and the same geographic region (Ningaloo Reef, Western Australia) were studied to identify differences in retinal specialisations that may reflect niche specialization. The main specialisation in the retinal cell density distribution is the dorsal streak that allows these animals to scan the substrate for potential prey. Visual specialisations in different species, although subtle, may reflect species specific ecological niches. Improving our understanding of how various elasmobranch species sense and interact with their environment using electroreception has distinct commercial applications through the development of electric shark repellents used to protect ocean users from aggressive encounters with sharks. In addition, the identification of specific electrosensory cues that may repel elasmobranchs may also lead to effective solutions for reducing bycatch and improving the efficiency of fisheries. 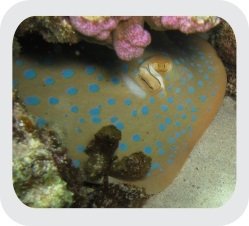 Research Paper: Kempster RM (2014) The role of electroreception in elasmobranchs. Ph.D. Thesis, University of Western Australia, Australia. Wobbegong sharks and angel sharks represent two distantly related families that have independently evolved a similar dorso-ventrally compressed body form to complement their benthic ambush feeding strategy. Consequently, these groups represent useful models in which to investigate the specific morphological and physiological adaptations that are driven by the adoption of a benthic lifestyle. 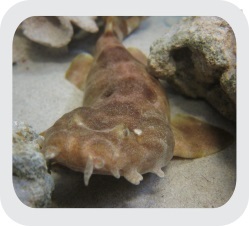 In this study, we compared the distribution and abundance of electrosensory pores in the spotted wobbegong shark (Orectolobus maculatus) with the Australian angel shark (Squatina australis) to determine whether both species display a similar pattern of clustering of sub-dermal electroreceptors and to further understand the functional importance of electroreception in the feeding behaviour of these benthic sharks. Research Paper: Egeberg CA, Kempster RM, Theiss SM, Hart NS and Collin SP (2014) Electrosensory system morphology and function in wobbegong and angel sharks. Marine and Freshwater Research. The electrosensory system is found in all chondrichthyan fishes and is used for several biological functions, most notably prey detection. Variation in the physical parameters of a habitat type, i.e. water conductivity, may influence the morphology of the electrosensory system. Thus, the electrosensory systems of freshwater rays are considerably different from those of fully marine species; however, little research has so far examined the morphology and distribution of these systems in euryhaline elasmo-branchs. 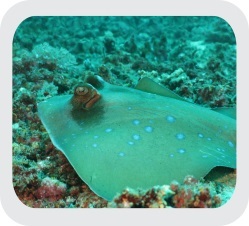 The present study investigates and compares the morphology and distribution of electrosensory organs in two sympatric stingray species: the (euryhaline) estuary stingray, Dasyatis fluviorum, and the (marine) blue-spotted maskray, Neotrygon kuhlii. This study indicates that the morphology of the electrosensory system in a euryhaline elasmobranch species seems very similar to that of their fully marine counterparts. However, some morphological differences are present between these two sympatric species, which are thought to be linked to their habitat type. Quantitative studies of sensory axons provide invaluable insights into the functional significance and relative importance of a particular sensory modality. Despite the important role electroreception plays in the behaviour of elasmobranchs, to date, there have been no studies that have assessed the number of electrosensory axons that project from the peripheral ampullae to the central nervous system (CNS). To fully appreciate the function of the electrosensory system, it is essential to assess the neural network that connects the peripheral system to the CNS. Using stereological techniques, unbiased estimates of the total number of axons were obtained for both the electrosensory bundles exiting individual ampullary organs and those entering the CNS (via the dorsal root of the anterior lateral line nerve, ALLN) in males and females of different sizes. The dorsal root of the ALLN consists solely of myelinated electrosensory axons and shows both ontogenetic and sexual dimorphism. In particular, females exhibit a greater abundance of electrosensory axons, which may result in improved sensitivity of the electrosensory system and may facilitate mate identification for reproduction. Sharks use highly sensitive electroreceptors to detect the electric fields emitted by potential prey. However, it is not known whether prey animals are able to modulate their own bioelectrical signals to reduce predation risk. Here, we show that some shark (Chiloscyllium punctatum) embryos can detect predator-mimicking electric fields and respond by ceasing their respiratory gill movements. Despite being confined to the small space within the egg case, where they are vulnerable to predators, embryonic sharks are able to recognise dangerous stimuli and react with an innate avoidance response. Knowledge of such behaviours, may inform the development of effective shark repellents. 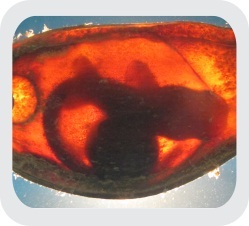 Research Paper: Kempster RM, Hart NS, Collin SP (2013) Survival of the Stillest: Predator Avoidance in Shark Embryos. PLoS ONE 8: e52551. Electroreception is found throughout the animal kingdom from invertebrates to mammals and has been shown to play an important role in prey detection, facilitating social behaviours, the detection of predators and orientation to the earth’s magnetic field for navigation. Electroreceptors in elasmobranchs, the ampullae of Lorenzini, detect minute electric fields and independently process these stimuli, thereby providing spatial information to the central nervous system on the location of a source, often potential prey. The ampullae of Lorenzini are individually connected to a single somatic pore on the surface of the skin, with the spatial separation of each pore directly influencing how electrical stimuli are detected and processed. Pore abundance varies across taxonomic groups resulting in unique species-specific differences. The intricate distribution patterns created by the specific positioning of somatic pores on the head are, however, consistent within families, resulting in patterns that are identifiable at higher taxonomic levels. As elasmobranchs evolved, the electrosensory system became more complex and highly specialized, which is evident by a general trend of increasing pore abundance over time. The elasmobranch electrosensory system has evolved to operate efficiently under the environmental conditions of the particular habitat in which a species lives. For example, reduced pore abundance is evident in oceanic pelagic elasmobranchs, for whom visual cues are thought to be of great importance. Pore abundance and spatial distribution may be influenced by multiple factors including head morphology, phylogeny, feeding behaviour and habitat. Research Paper: Kempster RM, McCarthy ID, Collin SP (2012) Phylogenetic and ecological factors influencing the number and distribution of electroreceptors in elasmobranchs. Journal of Fish Biology 80: 2055-2088.